Manifestos of arch rivals DMK and AIADMK released Tuesday bore a striking similarity on a number of issues, including on the release of seven convicts in the Rajiv Gandhi assassination. The rivals also spoke in one voice on providing reservation in the private sector and called for government control on fixing the price of petroleum products to keep their prices under check. 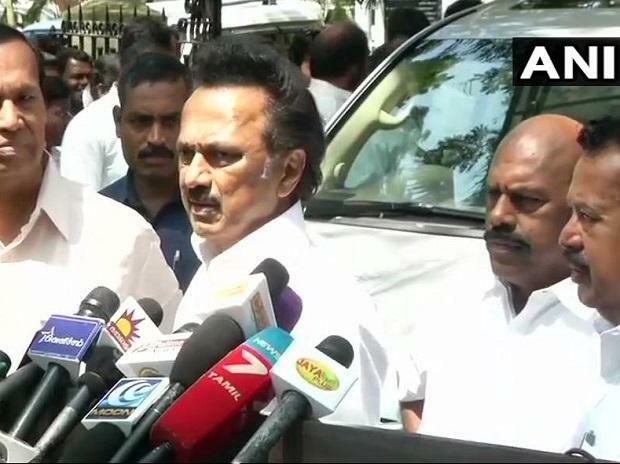 DMK President M K Stalin and AIADMK Coordinator O Panneerselvam released their respective list of assurances to the electorate ahead of the polls, scheduled on April 18. While DMK wanted the convicts in the Rajiv Gandhi assassination to be released on "humanitarian grounds", the ruling AIADMK said it would insist that the Centre and the President direct Tamil Nadu Governor Banwarilal Purohit to allow them to walk free. "The DMK urges the Central and state governments to take appropriate action to release on humanitarian grounds, the seven persons, including (AG) Perarivalan" since they were "languishing" in prison for more than 27 years, it said. DMK is an ally of the Congress. In its manifesto, the AIADMK, BJP's partner,said it would press the Centre "and the President to give due direction to the Tamil Nadu Governor for release of seven Tamil convicts, as ordered by the Supreme Court and approved by the cabinet of the Tamil Nadu government." In September 2018,the K Palaniswami-led state cabinet had recommended to Purohit the release of Murugan, Santhan, Perarivalan, Jayakumar, Ravichandran, Robert Payas and Nalini, all serving life terms for their involvement in the killing of former Prime Minister Rajiv Gandhi at an election rally here in 1991 by an LTTE suicide bomber. Though state Congress leaders have been opposed to the release of the seven convicts, party chief Rahul Gandhi had recently said he harboured no hatred towards those convicted for the assassination of his father. On Rajiv Gandhi's assassination in 1991, the Congress chief had said it had two aspects. "While one was personal, which we have dealt with, the other was the legal issue, which has to take its course. Whatever course the legal issue takes, we are happy with it," Gandhi had said at a press conference here last week. "We are quite forgiving people. We do not have animosity or hatred towards anybody and it is for the courts to decide (on the convicts' release)," he had said. On the NEET issue, which has emotive undertones in the state, DMK vowed to strive for scrapping it, while its rival batted for exemption to a large section of medical aspirants. NEET was "against the interest of the poor, rural and oppressed class students" across India, DMK said. "In the interest of social justice, DMK will strive for the abolition of NEET forthwith," it added. Daughter of a daily wage earner from a village in the district, she had also impleaded in a case in the Supreme Court against NEET. Her death triggered state-wide outrage, with all political parties and students coming together against the entrance exam. After its legal efforts and legislative measures to avoid NEET failed, the AIADMK government had set up coaching centres to train students for the entrance test. On Tuesday, the AIADMK batted for exemption. The party said it would press Centre to move Education from the concurrent list to the State list. It will strive for exemption for state students from NEET till such time they reach the standard and knowledge of the improved new syllabus, since its high standard 'adversely affects rural children and socially and economically weaker sections." These members constitute more than 85 per cent of the students "who are forced to write NEET Examinations,"it said. On reservation, the bitter rivals batted for a quota in the private sector for SC/ST, MBC and BC category candidates. The AIADMK promised to strive for enactment of a law to implement the reservation policy in the private sector, while DMK argued that quota must be provided in private firms since public sector units were being "gradually privatised." On fixing prices of petrol and diesel too, both parties stood on the same page, calling for a government control on rates. AIADMK said it would urge the Centre to take away the price fixing power from the consortium of oil companies and take it upon the government to evolve a people friendly policy so that prices of commodities come under control. The DMK promised to "reintroduce Administered Pricing Mechanism to control" prices of petrol, diesel and domestic gas and fertilizers.